Typical and Atypical Angina Pectoris. Table 4.2 Differential diagnosis of ischemic pain. In chronic stable angina pectoris the discomfort is predictably provoked by exertion and relieved by rest. A chronic stable coronary stenosis is, in most cases, the pathophysiological explanation of chronic stable angina pectoris. Unstable angina pectoris occurs with minimal exertion or at rest. The pain is new in onset or increasing in intensity. Character and location are typical, however the intensity is often more severe and the duration longer than in chronic stable angina pectoris. Pathophysiologically, unstable angina pectoris is associated with ruptured plaques and thrombi, which obstruct the coronary lumina. Occasionally, coronary vasoconstriction or spasms contribute to the typical dynamic clinical manifestation of unstable angina pectoris. Angina due to aortic stenosis and idiopathic hypertrophic subaortic stenosis, cocaine-induced coronary vasoconstriction. Class I-Angina only with unusually strenuous activity. Class II-Angina with slightly more prolonged or rigorous activity than usual. Class III-Angina with usual daily activity. Class I-Ordinary physical activity does not cause angina, such as walking, climbing stairs. Angina (occurs) with strenuous, rapid, or prolonged exertion at work or recreation. Class II-Slight limitation of ordinary activity. Angina occurs on walking or climbing stairs rapidly; walking uphill; walking or stair climbing after meals, in cold, in wind, or under emotional stress; or only during the few hours after awakening. Angina occurs on walking more than two blocks on the level and climbing more than one flight of ordinary stairs at a normal pace and in normal condition. Class III-Marked limitations of ordinary physical activity. Angina occurs on walking one to two blocks on the level and climbing one flight of stairs in normal conditions and at a normal pace. Class IV-Inability to carry on any physical activity without discomfort-anginal symptoms may be present at rest. • Angina is most common in middle-aged and elderly males. • Females are usually affected after menopause. • Prevalence of angina pectoris in people older than 30 yr is >3%. • Within 12 mo of initial diagnosis, 10% to 20% of patients with diagnosis of stable angina progress to MI or unstable angina. Fig. 4.1 Radiation of angina pectoris: 1 = left arm, 2 = right arm, 3 = left shoulder, 4 = neck, 5 = jaw, 6 = back, 7 = epigastrium. Emotional distress is a very common cause of atypical chest pain (Tab. 4.2). Functional chest pain should be considered, if the pain lacks a reasonable relationship to precipitating factors or features of anxiety and neurosis are present. Functional pain occurs at rest, lasts from seconds to hours, and is often localized to one point in the left chest. However, be aware that ischemic chest pain causes anxiety and therefore it may be at times difficult to differentiate between ischemic and functional pain. Pericarditis can result in severe chest pain originating from the heart. Pericardial pain is sharper and more tearing than ischemic pain. Pericardial pain lasts for hours and the intensity can be aggravated by changing body position or by breathing. Aortic dissection is suggested by sudden onset, sharp, tearing chest pain, felt in or radiating to the back. Musculoskeletal pain of the chest is a very common problem. Chest wall pain is usually located to one site of the chest and can be provoked by posture, motion, or pressure. Sometimes a local tenderness is present. The most common causes of chest wall pain are arthritis, chondritis, intercostal muscle injury, and coxsackie virus infection (e. g., Bornholm disease). • The most important diagnostic factor is the history. • The physical examination is of little diagnostic help and may be totally normal in many patients, although the presence of an S4 gallop is suggestive of ischemic chest pain. • An ECG taken during the acute episode may show transient T-wave inversion or ST-segment depression or elevation, but some patients may have a normal tracing. • Treadmill exercise tolerance test is useful to identify patients with coronary artery disease who would benefit from cardiac catheterization. Stress echocardiogram of radionuclide testing (e.g., thallium, persantine, dobutamine) are useful and sensitive in the detection of myocardial ischemia. • Although invasive x-ray coronary angiography remains the gold standard for the identification of clinically significant coronary artery disease, coronary magnetic resonance angiography can accurately detect coronary artery disease of the proximal and middle segments. This noninvasive approach, where available, can be used to reliably identify (or rule out) left main coronary artery or three-vessel disease. • Initial laboratory tests in patients with chronic stable angina should include hemoglobin, fasting glucose, and fasting lipid panel. • Cardiac isoenzymes (CK-MB q8h x 2) should be obtained to rule out MI in patients with unstable angina. • Cardiac troponin I and T are specific markers of myocardial necrosis and are useful in evaluating patients with unstable angina. Elevation of either of these proteins in the setting of an acute coronary syndrome identifies patients with a several-fold increased risk of death in subsequent weeks. Patients with negative troponin assays on arrival in the ER and repeated 4 hours later are at a low level of risk for cardiac events within the following 30 days, and most of these patients can be safely discharged from the ER. Troponin T tests can be false-positive in patients with renal failure, sepsis, rhabdomyolysis, fibrin clots, and heterophile antibodies. The presence of jaundice or the concurrent use of heparin can result in underestimation of troponin. • Cardio-CRP (hs-CRP)-elevation of cardio-CRP is a strong predictor of cardiovascular events and it adds prognostic information to that conveyed by the Framingham risk score. However, based on current data, it may be premature to adapt widespread assessment of cardio-CRP and of the other markers noted below. • Circulating interleukin-6 (IL-6), a cytokine with both proinflammatory and antiinflammatory effects, is a strong independent marker of increased mortality in unstable coronary artery disease and identifies patients who benefit most from a strategy of early intervention. • New markers for risk stratification in acute coronary syndromes based on neurohormonal activation and inflammation have recently been identified. A single measurement of B-type natriuretic peptide, a natriuretic and vasodilative peptide regulated by ventricular wall tension and stored mainly in the ventricular myocardium, obtained in the first few days after the onset of ischemic symptoms, provides predictive information for risk stratification in acute coronary syndromes. Pregnancyassociated plasma protein A (PAPP-A), which is found in both men and women, is an activator of insulin-like growth factor I(IGF-I), or amediator of atherosclerosis may be a marker for unstable plaques. Elevated plasma levels of PAPP-A can identify patients with unstable angina in the absence of elevations of either troponin I or C-reactive protein. • Echocardiography is indicated only in patients with suspected valvular abnormalities; it is also useful to evaluate LV function. The major classes of antiischemic agents are nitrates, b-adrenergic blockers, calcium channel blockers, aspirin, and heparin; they can be used alone or in combination. • Nitrates cause venodilation and relaxation of vascular smooth muscle; the decreased venous return from venodilation decreases diastolic ventricular wall tension (preload) and thereby reduces mechanical activity (and myocardial oxygen consumption) during systole. Relaxation of vascular smooth muscle increases coronary blood flow and reduces systemic pressure. Tolerance to nitrates can be minimized by avoiding sustained blood levels with a daily nitrate-free period (e.g., omission of bedtime dose of oral isosorbide dinitrate or 12 hr on/12 hr off transdermal nitroglycerin therapy). Nitrates are relatively contraindicated in patients with hypertrophic obstructive cardiomyopathy, and should also be avoided in patients with severe aortic stenosis. • b-Adrenergic blockers achieve their major antianginal effect by reducing heart rate and systolic blood pressure. Absent contraindications, they should be regarded as initial therapy for stable angina for all patients. Their dose should generally be adjusted to reduce the resting heart rate to 50-60 beats/min. • Calcium channel blockers play a major role in preventing and terminating myocardial ischemia induced by coronary artery spasm. They are particularly effective in treating microvascular angina. Short-acting calcium channel blockers should be avoided. Calcium channel blockers should generally also be avoided after complicated MI (CHF) and in patients with CHF secondary to systolic dysfunction (unless necessary to control heart rate). • Aspirin: give initial dose of at least 160 mg/day followed by 81 to 325 mg/day. Aspirin inhibits cyclooxygenics and synthesis of thromboxane A2 and reduces the risk of adverse cardiovascular events by 33% in patients with unstable angina. Patients intolerant to aspirin can be treated with the antiplatelet agent clopidogrel. • Heparin is useful in patients with unstable angina and reduces the frequency of MI and refractory angina. Patients with unstable angina treated with aspirin plus heparin have a 32% reduction in the risk of MI and death compared with those treated with aspirin alone; therefore, unless heparin is contraindicated, most hospitalized patients with unstable angina should be treated with both aspirin and heparin. Enoxaparin (low-molecular weight heparin) 1 mg bid SC is as effective as continuous unfractionated heparin in reducing the incidence of unstable angina. It is usually given for 3-8 days, or until coronary revascularization is performed. Longer administration does not provide additional cardiac benefits and may increase risk of hemorrhage. • Early administration of platelet glycoprotein IIb/IIIa receptor antagonists tirofiban and eptifibatide is useful in unstable angina, in high-risk patients with positive troponin tests, or those undergoing percutaneous revascularization. Abciximab, the first GPIIb/IIa inhibitor, is an important component of percutaneous revascularization.Started in the catheterization lab, it reduces the incidence of ischemic events. Contraindications to the use of GPIIb/IIa inhibitors are: severe hypertension (>180/110), internal bleeding within 30 days, history of intracranial hemorrhage, neoplasm, NVM, aneurysm, CVA within 30 days or history of hemorrhagic CVA, thrombocytopenin (<100 k), acute pericarditis, history or symptoms suggestive of aortic dissection, and major surgical procedures or severe physical trauma within previous month. Use of lipid-lowering drugs (e.g., statins) is recommended in patients with coronary heart disease and in patients with hyperlipidemia refractory to diet and exercise. Statins (e.g., pravastatin) also decrease the level of the inflammatory marker hs-CRP independently of the magnitude of change in lipid parameters. Pain Characteristics. The discomfort or pain of angina pectoris is typically dull and tightening. It is often described as “pressing,” “tearing,” “constricting,” “squeezing,” “burning,” or as chest heaviness, a “band across the chest,” or “weight in the center of the chest” (Tab. 4.2). Angina pectoris is often accompanied by dyspnea. Dyspnea is caused by pulmonary congestion, secondary to increased left ventricular filling pressures. In fact, occasionally dyspnea may be the only symptom of myocardial ischemia and may represent an “angina equivalent.” Radiation of angina pain is common. 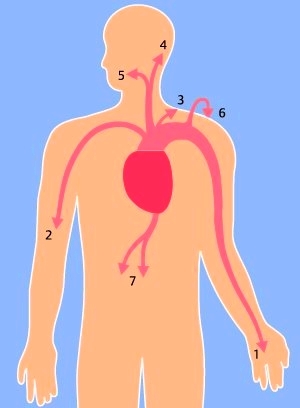 Angina pain radiates most typically to the left shoulder and arm, although many other locations are possible (see Fig. 4.1). Occasionally, the pain is only felt at the radiation point, e. g., in the jaw or the arm. Angina pectoris pain occurs with physical exertion and abates promptly (less than five minutes) at rest. Angina can also be provoked by exertion, emotions, heavy meals, and cold, windy weather. Not infrequently, patients wake up from sleep having angina pain and quite often the pain occurs with the first physical activity in the morning. Stable, and most often also unstable angina pectoris is promptly relieved by nitrates. The response to nitroglycerin may be used to differentiate angina pain from other causes of chest pain. However, keep in mind that pain originating from a hiatal hernia, esophageal spasm, or mild biliary colic may abate after nitroglycerin, too. The severe pain in acute myocardial infarction is often preceded by episodes of typical and atypical chest pain. This is an expression of the intermittent flow obstruction, secondary to the varying thrombus size at the site of the ruptured plaque. • Although there is significant individual variation, most patients complain of substernal chest pain (pressure, tightness, heaviness, sharp pain, sensation similar to intestinal gas or dysphagia). • The pain is of short duration (30 sec to 30 min), nonpleuritic, and often accompanied by shortness of breath, nausea, diaphoresis, and numbness or pain in the left arm, jaw, or shoulder.